Political speeches aren't always the most exciting to watch - and one little boy has demonstrated that in an extremely relatable moment that has since gone viral. 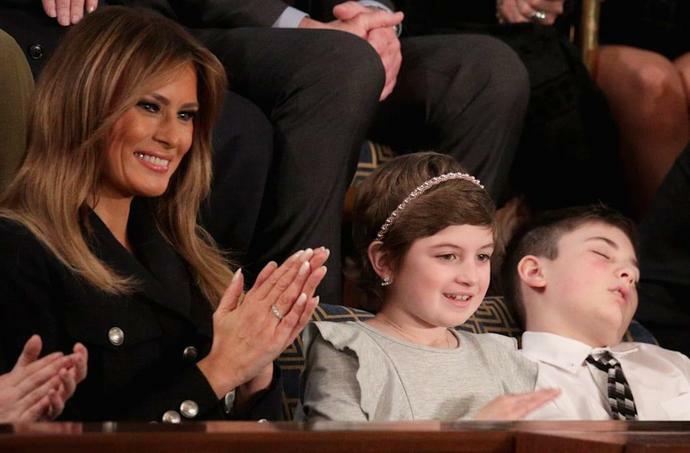 Joshua Trump, the 11-year-old boy invited to attend the State of the Union address by Melania Trump after he was bullied over his presidential last name, fell asleep during the Tuesday night event. Photos of Joshua snoozing while sitting with the first lady and childhood cancer survivor Grace Eline were widely circulated on social media, capturing hearts across the country. "JOSHUA TRUMP RULES," wrote Army Veteran Josh Weinberg. "Joshua is my favorite Trump," joked another user. Joshua, a sixth-grade student at Talley Middle School in Wilmington, Delaware, made headlines in December after speaking out about the bullying he endured at the hands of his classmates since Donald Trump announced he was running for president in June 2015. His mother, Megan Trump, said that Joshua, who is unrelated to the president, suffered serious emotional distress because of the relentless teasing, which got so bad the child wanted to change his surname to that of his stepfather, Bobby Berto. "They curse at him, they call him an idiot, they call him stupid," his mother told WPVI in a 2018 interview. "He said he hates himself, and he hates his last name, and he feels sad all the time, and he doesn't want to live feeling like that anymore, and as a parent that's scary." The first lady has made combating bullying one of her main priorities in the White House through her "Be Best" initiative, though the movement has faced scrutiny due to the notorious name-calling tactics employed by the president on social media. Regardless of any backlash, the White House said Joshua was "thankful to the first lady and the Trump family for their support."